UK company Arbiter Electronics released in 1966 what would be one of the most beloved guitar effects of all time, the Fuzz Face. The simplicity of the circuit has caused much debate and lore, but two transistors, three capacitors and a couple of resistors still sounds like magic. The first version produced from 1966-â€™68 had NKT 275 germanium transistors and in 1969 Dallas switched to the bit more relying silicon transistors. David started out with a basic set up in 1968: Vox wah wah, Binson Echorec and a Fuzz Face. Between 1968 and 1970 he used germanium NKT 275 models. The warm overdrive tone can be heard on songs like Corporal Clegg, Let There Be More Light and Nile Song among others. Then in early 1971 he went over to silicon transistor units (BC108), which had lot more gain and a brighter tone. Compared to a germanium model the silicon tone is more difficult to control only by using the guitar volume so David also incorporated a DeArmond volume pedal into his setup. 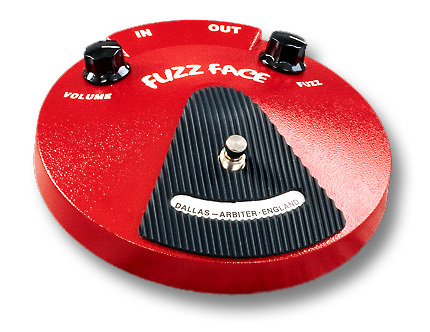 The silicon Fuzz Face can be heard on songs like When You’re In, Time and Money among others. – David would roll down the guitar volume to adjust the gain for a milder fuzz/overdrive on rhythm parts. Between 1971-1975 he also used a Colorsound Power Boost with the silicon Fuzz Face to add even more gain and sustain. The silicon transistor Fuzz Face is recognized by it’s bright, edgy fuzz with rich sustain, while the germanium transistor Fuzz Face is slightly muddier, warmer and closer to an overdrive. David used the Fuzz Face on the recording of his first album with Pink Floyd, – Saucerful of Secrets and it remained his main fuzz/distortion unit up until 1976 when he went over to the Big Muff and Pete Cornish P1. Still, the Fuzz Face was included in his boards until 1981 (then with BC109 silicon transistors). In the earliest days, David used the Fuzz Face both as a lead unit and as overdrive by adjusting the guitar volume for more/less gain. You can hear a milder Fuzz Face setting on songs like Cymbaline and Fat Old Sun, whereas Echoes, Money and Time has the distinct full set FF sound. David used many different looking Fuzz Face units, like the original grey/silver hammertone chassis and the classic red and a blue. In the early days, before he got his first pedal board in 1973, the Fuzz Face was simply lying on the floor hooked up with the other pedals. He also had a second unit hooked up to the slide guitar (lying under the guitar) in 1974-75. Thanks to Rafal Zychal for assistance.